No Ohio State will fan ever take The Game against Michigan for granted — at least, no Ohio State fan who lived through the ’90s. For Ohio State fans, the ’90s were the long, dark night of the soul. Ohio State was coached by a cordial, good-humored gentleman named John Cooper. Coop wasn’t an Ohio native, but he could recruit great athletes and get them ready for early season games. His record at Ohio State was 111-43-4. He beat Notre Dame twice, and won a Rose Bowl and a Sugar Bowl. But when it came to The Game, Coop turned into a fingernail-chewing, watery-eyed wreck. His teams were 2-10-1 against That Team Up North, and it got so bad that the Ohio State President described the tie as one of the greatest victories in Ohio State history. During the Cooper era, Ohio State played Michigan as the favorite and as the underdog. It played the Wolverines at home and away. It played Michigan when the Buckeyes were highly ranked and when they were struggling. And all of that made no difference, because the result — inevitably — was another soul-crushing loss. Whether it was a record-setting performance by a previously unknown running back or a slip and fall by a defensive back or some other disaster, Michigan always found a way to win. Eventually, the Buckeye Nation had had enough, and Coop was gone and Jim Tressel was in. Whenever Ohio State goes to The Game as a favorite, I think of John Cooper and his struggles with the Wolverines. It’s left me permanently scarred, and I will never forget. John Cooper taught me to never take The Game for granted. The NCAA Tournament is put up or shut up time. All year we hear about teams and conferences, and then March Madness comes and separates the pretenders from the contenders. This year, there’s been a lot of talk — from people not named Charles Barkley — about the Big Ten being the best conference in basketball. Seven teams from the Old Conference made it to the Big Dance, and so far they’re represented the league well. The Big Ten’s record after the round of 64 is 6-1, with the only hiccup being Wisconsin’s dismal performance against Mississippi in a game where the Badgers simply could not put the ball into the basket. The Big Ten’s top-seeded teams, Indiana and Ohio State, both won by wide margins, Michigan State and Michigan played well in convincing wins, Illinois survived some poor shooting to beat Colorado, and Minnesota spanked UCLA in a surprising upset. Other conferences that were touted prior to the tournament, such as the Big East and the Mountain West, did not fare so well during the first round of play. The great thing about the NCAA Tournament, of course, is that everything can turn on a dime. All of these Big Ten teams could lose their next game — and if that happens the conference will be viewed as an overrated paper tiger. For now, the Big Ten has 6 teams in the round of 32, and that’s not bad. The Michigan Wolverines have had a tough time of it lately. Michigan was undefeated for the first two months of the season. On January 12, they were 16-0 and ready to become the number one-ranked team in the nation. At that point, everyone raved about the Wolverines’ offensive efficiency, their tough defense, their talented players like Trey Burke and Tim Hardaway, Jr., and their heralded freshmen like Glenn Robinson III and Nik Stauskas. On January 13, however, Ohio State held the high-flying Michigan offense to 53 points and beat the Wolverines in Columbus. Since then, the other coaches in the Big Ten — which some people call the best-scouted league in the country — have tried to exploit the weaknesses first exposed by the Buckeyes. Michigan ended the regular season 25-7 and lost 5 of its last 10 games. Today Michigan got knocked out of the Big Ten Tournament by Wisconsin, losing 69-58. The Wolverines lost even though they held Wisconsin to only 17 points in the first half. Michigan fans are depressed, but college basketball is full of ups and downs. If I were a Michigan fan — and I’m not, of course — I’d be glad that the Wolverines are done with the Big Ten and can focus on the NCAA Tournament. Michigan has a lot of talent, and if they play teams that don’t play defense like they do in the Big Ten, Michigan could make a run in the Big Dance. I wouldn’t count them out. The Big Ten conference season has reached the halfway point. Two things appear to be true: the conference is filled with good teams, and the race for the regular season championship is likely to go down to the wire. So far, the two best teams appear to be Indiana and Michigan. Indiana leads the Big Ten with an 8-1 record after beating Michigan at Bloomington Saturday night, and Michigan is right behind at 7-2. Also at 7-2 are Michigan State and Ohio State, and Wisconsin — which has handed Indiana its only conference loss, and at Bloomington, no less — stands one game back at 6-3. Minnesota has had some surprising stumbles on its way to a 5-4 record, and the Illinois squad that came to the Big Ten schedule 13-1 and then beat the snot out of Ohio State at Assembly Hall has collapsed to a 2-7 conference record. Indiana and Michigan have been impressive because they appear to be complete teams that have multiple offensive weapons, can play at all kinds of tempos, and pose significant match-up problems for most teams. Not coincidentally, the Hoosiers and Wolverines feature three of the Big Ten’s best players in Indiana’s Cody Zeller and Victor Oladipo and Michigan’s Trey Burke. The well-rounded nature of Indiana and Michigan distinguish them from the Spartans, Buckeyes, and Badgers, all of which play very tough defense but often struggle at putting the ball into the basket. Buckeyes fans should be thrilled with a 7-2 record, because this year’s team has some obvious holes. Deshaun Thomas is the Big Ten’s leading scorer, but he also has been Ohio State’s only reliable offensive weapon. The other starters — Aaron Craft, Lenzelle Smith Jr., Sam Thompson, and Amir Williams — have had their ups and downs, but each game one of those players steps up and scores enough to keep opposing defenses honest. The Buckeyes also have the consistent hallmark of a Thad Matta-coached team: they play hard-nosed defense and man up until the shot clock hits zero. So far, the team also has done what you must do in the Big Ten — win your conference games at home and steal a few of the away games against the beatable teams. The road gets tougher for Ohio State, starting immediately. The Buckeyes play at Michigan tomorrow night, where the Wolverines will be looking to avenge their loss at OSU a few weeks ago. Then, on Sunday, the Buckeyes welcome Indiana to Value City Arena. By this time next week, we’ll have a better idea of whether this Buckeye team should be put in the contender, or pretender, category. This afternoon the Ohio State men’s basketball team welcomes the Michigan Wolverines to the Schott. It will be the first conference game in years where the rest of the Big Ten is rooting for the Buckeyes to win. During most of Thad Matta’s highly successful tenure as the Ohio State coach, the Buckeyes have been at the top of the Big Ten. They’ve dominated the Wolverines and knocked them out of the Big Ten Tournament three years in a row. This year, though, the tables are turned. Michigan is unbeaten and, with Duke’s loss yesterday, will be ranked number 1 in the land if they can beat the Buckeyes today. Ohio State, on the other hand, has seen its offensive struggles continue and isn’t the overwhelming force of the past few years. The Buckeyes got crushed on the road at Illinois and will have to play their best game of the year to beat the Wolverines. Michigan is talented and deep. They’ve got the best point guard in the conference in Trey Burke, who dishes out assists and leads the Wolverines in scoring. Tim Hardaway, Jr. and freshmen Nik Stauskas and Glenn Robinson III also average double-digit point production. The Wolverines have shot better than 50 percent from the field and are averaging more than 80 points a game. Ohio State fans would love to see the Buckeyes put up those kinds of statistics. The Big Ten is supposed to be competitive this year. For that to happen, teams like Ohio State must beat the Michigans, Indianas, and Minnesotas at home and win on the road against the weaker teams. So far in conference play, Michigan has beaten Northwestern, Iowa, and Nebraska, three of the struggling teams. Buckeye Nation hopes that Ohio State introduces Michigan to a real, full-throated, hostile Big Ten environment today at the Schott. I’m expecting the Buckeye Nut House — the student section located behind the visitors bench — to scream their brains out and get treated for laryngitis tomorrow. With a little help from the crowd, Ohio State could pull off an upset. Edited to add: Ohio State got out to a big lead in the first half, then held on for dear life to hand the Wolverines their first loss. The crowd seemed to be really into the game, and their enthusiasm clearly helped the Buckeyes. Will The Sophomores Step Up? Tonight the Ohio State University men’s basketball team plays its first Big Ten contest of the season. The Buckeyes take on Nebraska at the Schott. It will be the start of what promises to be a very challenging Big Ten season. Michigan is undefeated and ranked second in the land, preseason favorite Indiana has lost only once and is ranked fifth, and Minnesota and Illinois each have lost only once and are ranked ninth and eleventh, respectively — and that list doesn’t even include perennial contenders Michigan State and Wisconsin. The consensus view of analysts is that the Big Ten is the toughest conference in the country. What about the Buckeyes? They are 10-2, but they’ve lost the only two games they’ve played against powerhouse teams, falling to Duke away and Kansas at home. In both cases, a big problem was shooting the ball. Ohio State plays solid defense but struggles to knock down shots in their half court offense. Deshaun Thomas can be counted on to put points on the board, but the team lacks a consistent number two scorer. Point guard Aaron Craft is a defensive whiz, but he struggles with his outside shot and the lack of Jared Sullinger in the middle has affected his opportunities to drive to the basket. Guard Lenzelle Smith, Jr. is a hustler but his offensive production is streaky. Center Evan Ravenel — the only senior on the team — has decent offensive skills but is undersized. That leaves Buckeye fans looking to members of Ohio State’s heralded sophomore class: guard Shannon Scott, forwards LaQuinton Ross and Sam Thompson, and center Amir Williams. All have shown improvement over their performance last year. Scott seems to be playing with much more confidence, particularly on the offensive end, Thompson has developed a jump shot to go with his awe-inspiring dunks, and Ross has showed signs of having the all-around offensive game that makes Buckeye Nation wonder whether he can become another Deshaun Thomas. Williams’ progress has been slower. He doesn’t have a dependable “big man” offensive move, yet, but he is becoming a disruptive force on the defensive end with his shot-blocking abilities. If Ohio State is going to contend for the Big Ten championship this year — and that’s a big if, with the depth of talent in the conference this year — it will be because these members of the sophomore class step up, contribute on the offensive end, and play tough on the road. Their first test is tonight. Whew! Ohio State escaped from Camp Randall Stadium with a 21-14 overtime win in one of the toughest, hardest-fought games you’re likely to see this year. It wasn’t a pretty game offensively. The Buckeye offense was pitiful during the second half, when it had multiple chances to put the game away. The low point came when, with time running out in the fourth quarter, the offense could have salted the game away with one first down — but was unable to pick it up. Wisconsin’s defense was terrific, and never let Braxton Miller shake loose. The Badgers covered the Ohio State receivers like a wet blanket, and Miller often seemed baffled about what to do. Ohio State’s coaching staff had better figure that out, because Michigan will be studying how Wisconsin defended the Buckeyes and will try to follow that approach next week. 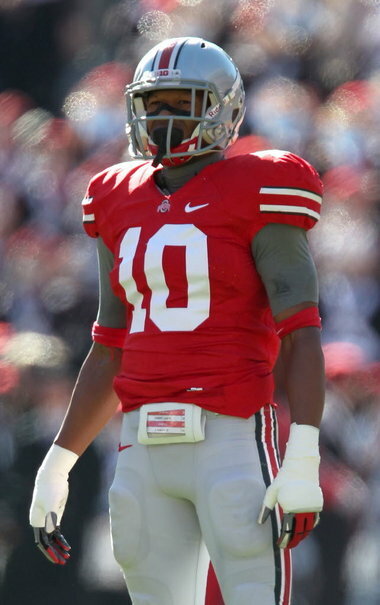 The Ohio State defense, though, was stellar. The Silver Bullets gave up yardage to Montee Ball — who doesn’t? — but penned him in and produced countless big plays. The biggest was the lick Ryan Shazier laid on Ball to force a fumble on a fourth and goal with time ticking down in the fourth quarter, followed by a stout stand that gave the Buckeyes the win in overtime. Defensive lineman John Simon was all over the field, playing his heart out. He graduates this year, but his studly, never-say-quit play has earned him a place in the pantheon of Buckeye gridiron greats. This was the kind of rugged defensive battle that epitomizes Big Ten football. The Buckeyes prevailed, won the Big Ten Leaders division (who cares? ), and moved to 11-0. Now it’s on to Michigan Week, when the Wolverines come to the Horseshoe. In football’s greatest rivalry game, Michigan will have the chance to ruin Ohio State’s perfect record, and Ohio State will have the opportunity to keep Michigan out of the Big Ten championship game. It doesn’t get much better than that.